Settle Your Glitter is a an app featuring a virtual calm down jar developed to help children regulate their emotions through calming visuals aimed to create positive self regulation habits. The app consists of a visual calm down strategy children can use when they are feeling worried, mad, sad, or silly. When you enter the app it asks the child how they are feeling. Once an emotion is selected, they rate their feeling from not feeling that way at all to feeling it in the extreme form. The child then shakes the phone or tablet to fill a virtual snow globe with glitter. A pufferfish expands and shrinks nearby to give the child a visual to take deep breaths alongside. The child can take deep breaths and watch the glitter settle at the bottom of the snow globe. This app is an excellent way to provide an on-the-go visual with a self regulation strategy and eventually help promote independent mindfulness and emotion regulation. The glitter will take longer to settle based on the severity of the emotion the child reports. For example, if a child is extremely worried he will have more time to take deep breaths, watch the glitter fall, and calm down. The child can decide if he is emotionally regulated once. Every Moment Counts is a mental health promotion initiative developed to help all children and youth become mentally healthy in order to succeed in school, at home and in the community. Children go to the cafeteria every school day for lunch and to socialize with friends. Many students look forward to lunchtime, but for some students, lunch in the cafeteria is not a good experience. 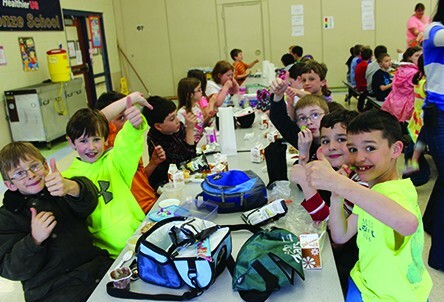 The Comfortable Cafeteria program aims to help all students enjoy lunchtime more by creating a positive atmosphere which encourages positive mental health in students. What is the program? Comfortable Cafeteria is a six week long program that helps give lunchroom staff and students the knowledge needed to foster a positive atmosphere in the lunchroom through six weekly themed education days during a six week period of time. The six weekly themes are, kickoff, friendship, conversations, including others, sensory input, and healthy foods. All participants learn about these topics through interactive programs. Who implements the program? The program was designed by occupational therapists, however, it is implemented through the collaboration of many individuals including, cafeteria supervisors, parent volunteers, teachers, therapists, schools nurses, school psychologists, school counselors, and many more. Benefits of the Program Many schools have implemented this program and have seen numerous benefits during the implementation and after. Children came away from the program with more knowledge of acceptance of peers, knowledge on how to build friendships and communicate with others, and how to make healthy. Now that the holidays are over, children may need a few reminders on how to interact in a positive way during therapy sessions, in the classroom, or at home when doing homework. Try reflecting on what behavior management strategies worked during the first half of the year and if there are new ones you may want to implement. Below are some strategies that can help prevent problematic behaviors before they start to make it a great homework, therapy, or classroom session for everyone! 1. Set therapy rules and make them known at the beginning of each sessio n. Post a list of “class rules” along with pictures so students know what is expected. The rules can be positive statements like, “we will raise our hand when we want to speak,” and “we will listen to the teacher and follow directions”. Keep in mind that some students may not know what it means to “listen to the teacher”. 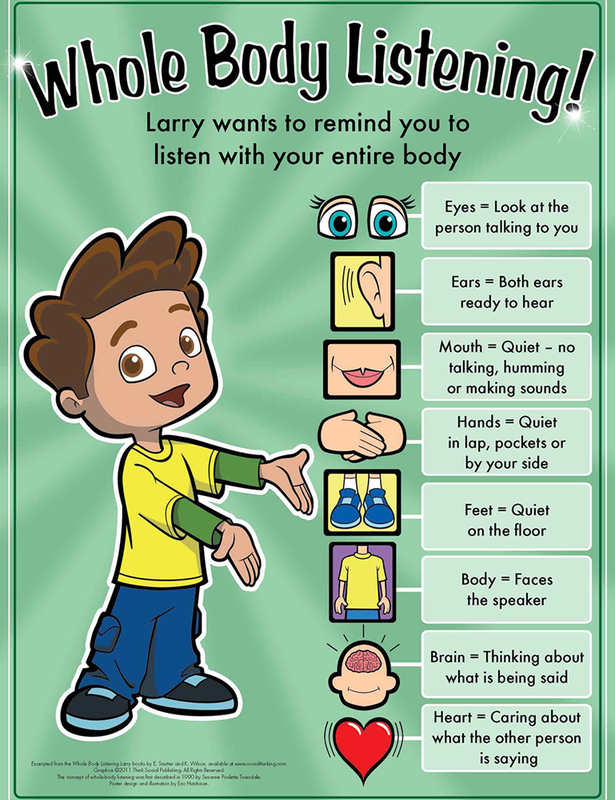 Social Thinking has a great visual called “Listening Larry” which teaches students what “Whole Body Listening” looks like. To learn more about this and to purchase the poster, visit https://www.socialthinking.com/Products/Whole%20Body%20Listening%20Poster 2. At the beginning of a session provide students a visual schedule of what will happen in therapy that day. This way students see what is coming next and when the session will end. You can create these on smart boards,. Blocks- The possibilities are endless when using blocks. You can practice fine motor skills by stacking, engage in pretend play by building houses, castles, etc., discuss colors, and use prepositions to talk about where you’re putting the blocks. 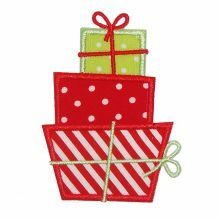 Lacing Beads in a Box- By: Melissa and Doug- Practice fine motor skills by having your child string the beads on a string. You can also talk about the colors, numbers, and shapes of the beads, take turns putting the beads on the string, and practice one to one correspondence while counting the items on the blocks. Band in a Box Drum! Click! Clack! By Melissa and Doug- Kids can pretend like they are in a band, play the instruments along to music, dance.